P-3 Orion is four engine turboprop Anti Submarine and Maritime warfare aircraft designed in the early 60s on the basic airframe of L-188 Electra commercial airliner. It flew for the first time in 1969 and today it has evolved into the mainstay Anti Submarine platform for front line Navies and Air Force of 17 different countries. With over 400 aircrafts in service across the globe, P-3C is the first choice of Navies for their Anti-Submarine requirements. 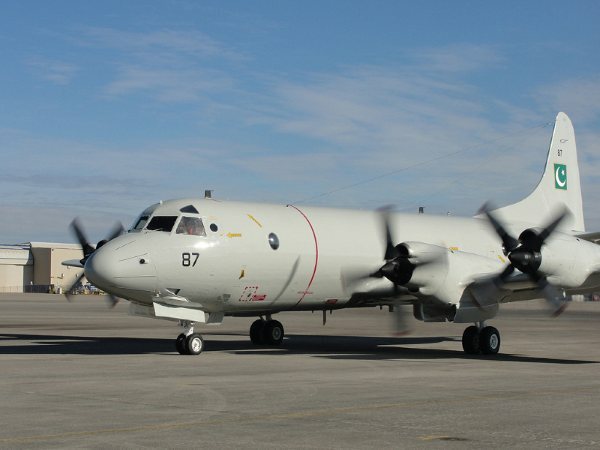 Apart from Anti-Submarine Warfare and Maritime surveillance, P-3C Orions can be used for Reconnaissance, Targeting, AEW&C, directing search and rescue, drug interdiction, monitoring of severe weather and humanitarian flights. P-3 offers all this as it is one of the most adaptable, durable, upgradeable, safe and exceptionally effective aircraft for Navies around the world. Since 1969, P-3C’s have undergone more then 100 airframe, electronics and weapons upgrade in order to cater the needs of the 21st Century Maritime Surveillance and Marine Warfare. Deadly weapons like AGM-84 Harpoon, AGM-65 Maverick, Stand Off Land Attack Missiles (SLAMs) when coupled with the unmatched combat radius of 2400 nautical miles make the P-3C Orion, the worlds most deadly ASW aircraft. Its maximum payload of 20000lb provides it with an advantage of neutralizing multiple targets without running out of ordnance. Pakistan’s location on the Indian Ocean next to the Persian Gulf, and its rivalry with India, ensure that its maritime patrol and strike capabilities will need to operate across a wide expanse of ocean. Maritime patrol aircraft are critical to that effort, because of the surveillance area that a single plane can cover. Like India, Pakistan relies on a mix. In its case, that mix includes converted Fokker F27 twin-turboprops, a couple of early-model Dassault Atlantiques, and a high-end force of 2 P-3C Orion aircraft, reactivated in 2006. The 4-engine Orions have much better range than Pakistan’s other maritime patrol aircraft, which widens that country’s sphere of naval influence. Summary of P-3C aircraft delivered to Pakistan Navy between 1996 and 2010. 1) Brand new P-3C Orion serial# 81 (previously serial# 25) – In service with Pakistan Navy. 2) Brand new P-3C Orion serial# 82 (previously serial# 26) – In service with Pakistan Navy. 3) Brand new P-3C Orion serial# 83 (previously serial# 27) – Lost in accident off the coast of Pasni on October 29, 1999. 4) Ex-US Navy P-3C Orion serial# 84 – Destroyed in attack on PNS Mehran on May 22, 2011. 5) Ex-US Navy P-3C Orion serial# 85 – In service with Pakistan Navy. 6) Ex-US Navy P-3C Orion serial# 86 – In service with Pakistan Navy. 7) Ex-US Navy P-3C Orion serial# 87 – Destroyed in attack on PNS Mehran on May 22, 2011. 8 ) Ex-US Navy P-3C Orion serial# ? – Due for delivery to Pakistan after refurbishment/upgradation work by Lockheed Martin. 9) Ex-US Navy P-3C Orion serial# ? – Due for delivery to Pakistan after refurbishment/upgradation work by Lockheed Martin. For Pakistan, P-3C Orion was one of the most lethal platforms and our Anti-Submarine capability sought its pride on these Orions. The Indian Navy’s similar ASW aircrafts (i.e. Il-38) are outclassed by the capabilities and durability of P-3Cs. This pushed the Indian Navy to acquire the much expensive and latest American made P-8 Poseidon, the replacement for P-3C Orion for the US Navy and its Allies. The attack on PNS Mehran clearly indicates that the militants wanted to paralyze Pakistan’s most lethal Maritime Asset. But unfortunately they succeeded and our Navy had to pay the price of losing expensive assets and honorable officers and courageous firefighters. While the leaders keep on draping themselves with our money, these young souls gave up their lives to save the assets owned by Pakistanis.